Some dealmaking may be on the horizon between the Howard Hughes Corp. and community leaders over development of the company’s latest Seaport investment, 250 Water Street. In June, Hughes Corp. bought the full-square-block parcel from Milstein Properties for $180 million. 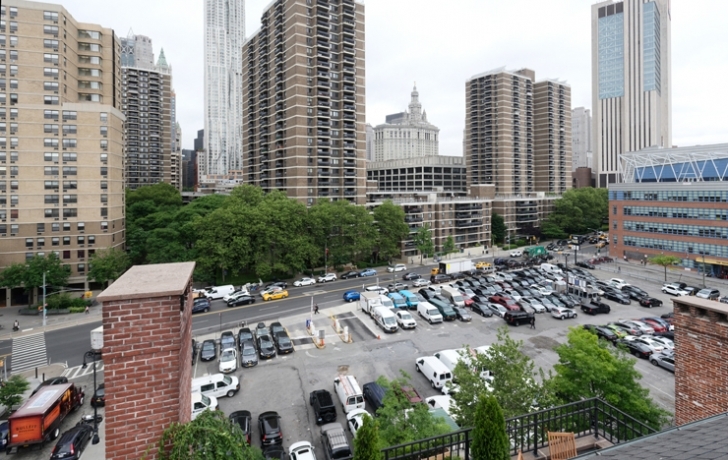 The company says it has yet to come up with plans for the site, now a parking lot bordered by Pearl, Peck Slip and Beekman. But limited by zoning to a 120-foot-tall, 290,000 square foot building, the developer is talking about possible trade-offs with the community and the city that might win them support for a taller structure. In a battle led by Community Board 1, the Seaport Historic District was downzoned in 2003, halting any Milstein project that opponents would see as unsuitable for the low-rise, historic neighborhood. Now that Hughes Corp. has inherited the site, it is yet to be seen how the company will deal with the same restriction. The developer says it has about 450,000 square feet of air rights from two properties it leases from the city: Pier 17 and the nearby Tin Building. In theory those air rights could be transferred to 250 Water Street, but it would not be easy, starting with the arduous land use review required for a zoning variance. Further, the Pier 17 and Tin Building sites cannot “grant” air rights, and 250 Water Street cannot receive them, according to a City Planning document that details the rules and restrictions for transferring development rights in the Seaport. So any deal that wins community and city blessings, if there is to be one, would almost certainly have to come with some hefty incentives from the developer. Community Board 1 and the Hughes Corp. have clashed in the past, especially over a proposal—later scrapped—for a 600-foot-tall tower on the site of the New Market Building. Both sides now appear intent on forging a cooperative relationship in discussions over 250 Water Street. Speaking to the committee, Scherl mentioned a laundry list of Seaport-area needs for potential dealmaking. The Peck Slip School lacks an auditorium. Pier 16 is in bad shape. The city would like the esplanade completed between Pier 17 and the Brooklyn Bridge, and it also wants more affordable housing. Scherl singled out the chronically struggling South Street Seaport Museum as particularly worthy of help, and said he has been in talks with its executive director, Jonathan Boulware, about the institution’s needs. “There’s a whole bunch of stuff that we’ve been working with him on,” Scherl said. Boulware, through a spokeswoman, declined to comment on discussions with the developer. Paul Goldstein, the former longtime CB1 district manager and now board member, recalled the struggle to downzone the site and prevent Milstein from erecting a tower at 250 Water Street. While the board in the past has wrung concessions from developers in exchange for community amenities, such as schools, the future of this site may be different, Goldstein argued at the meeting. “We’re going to have to think very long and hard about taking one of our greatest victories probably by this community board and cashing it in,” he said. The east side of the district lacks amenities, such as parks, ball fields and community centers, that are abundant on the district’s west side, countered the board’s co-chair, Paul Hovitz. “We said we want the museum and the museum is on the verge of bankruptcy if something isn’t done for it,” he added. Whatever is decided for 250 Water Street, Scherl noted, there will be people who are not happy. Submitted by admin on Fri, 08/03/2018 - 3:57pm. happen. This is where their Texas-sized chutzpah comes in. Seaport Historic District, a move that was later upheld in court. that HHC plays by the rules.